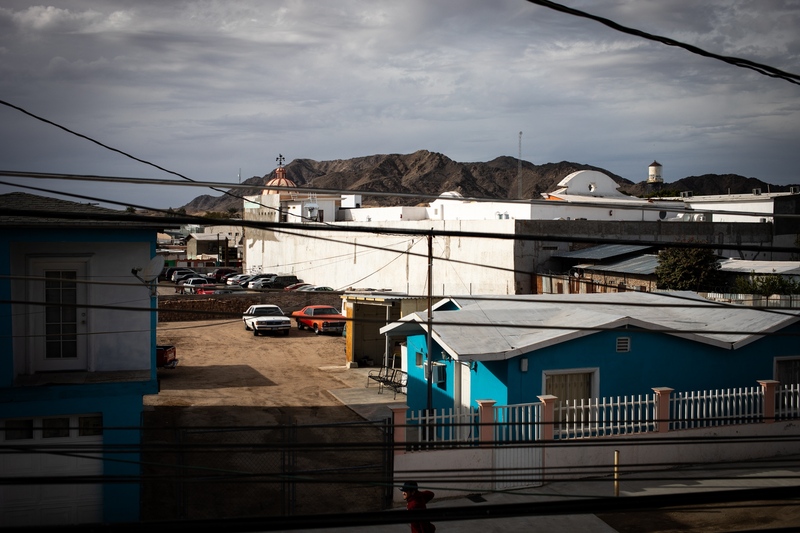 A view of Los Algodones, Baja California. The town is just 7 miles west of Yuma (Arizona). Early in the morning visitors start walking through the alleys of the historic downtown, looking mainly for dental clinics, opticians and pharmacies. Dr. Paul Lopez and his assistant perform a full mouth restoration procedure on Ajay Jallow, , 58 years old from Illinois, in one of the surgery rooms at Sani Dental, the biggest dental clinic in Los Algodones. All around town the streets are covered with signs and billboards for dental clinics, opticians and pharmacies with English instructions. 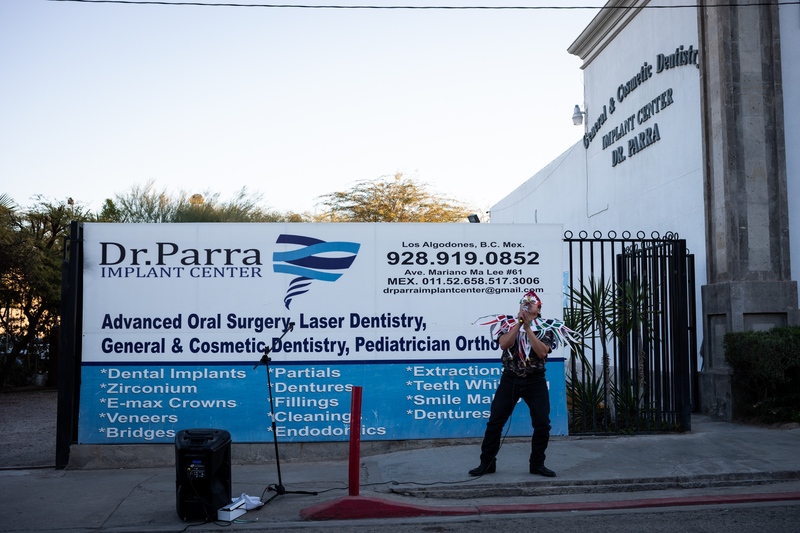 The biggest dental clinics in Los Algodones invest a lot of money in marketing. A portrait of Carmen Turner, 69 years old from Utah, outside the dental clinic where she's been a patient a couple of years now. Carmen is at her third trip to Los Algodones and she loves it, because "it's way cheaper than the U.S. but also safe". She found out about the town through her cousin, who works there as a chiropractor. A view of the border from a parking lot. 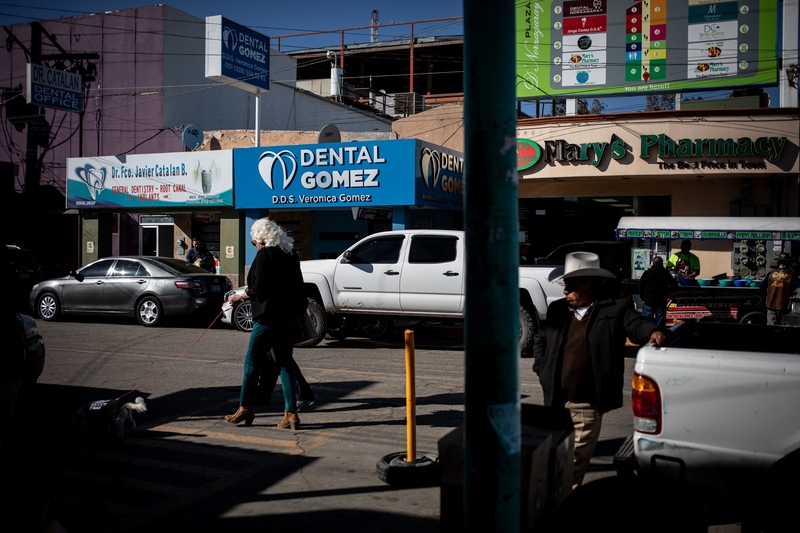 With a population of about 6,000 people and 400 dental clinics, Los Algodones has earned the nickname of Molar City. 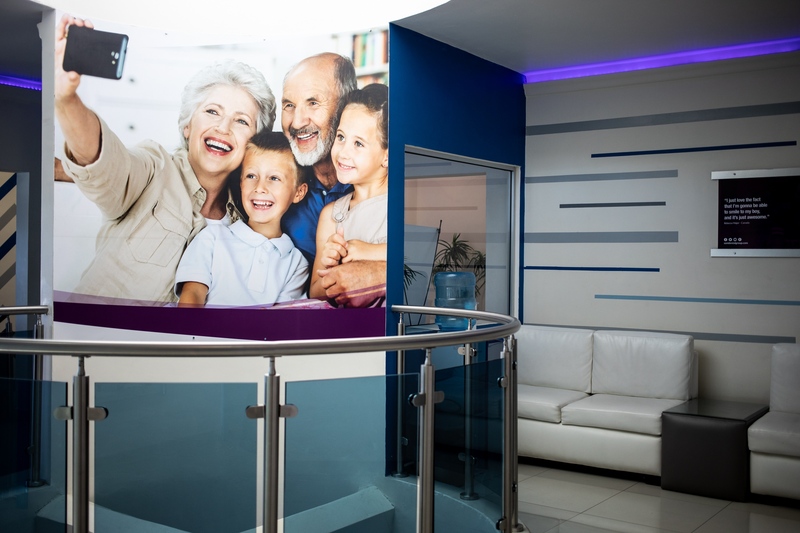 One of the two waiting rooms at Sani Dental, the biggest dental clinic in Los Algodones, Baja California. Dr. Diego Valenzuela, 33 years old. 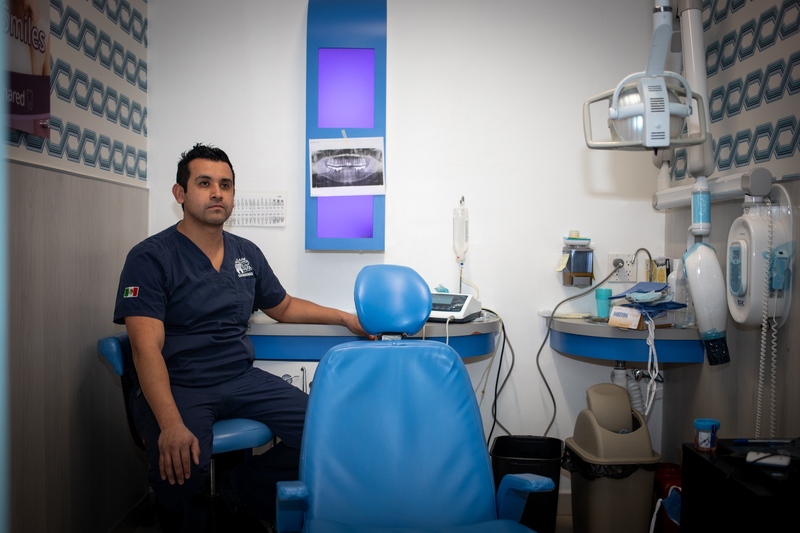 He studied to become a general dentist in Mexicali and then he specialized to become an oral surgeon at a dental school in Puebla . He has been working in Los Algodones for three years an a half. During the long wait in line to cross the border back to the U.S., local musicians entertain tourists in exchange of a money offer and street vendors sell snacks and souvenirs. 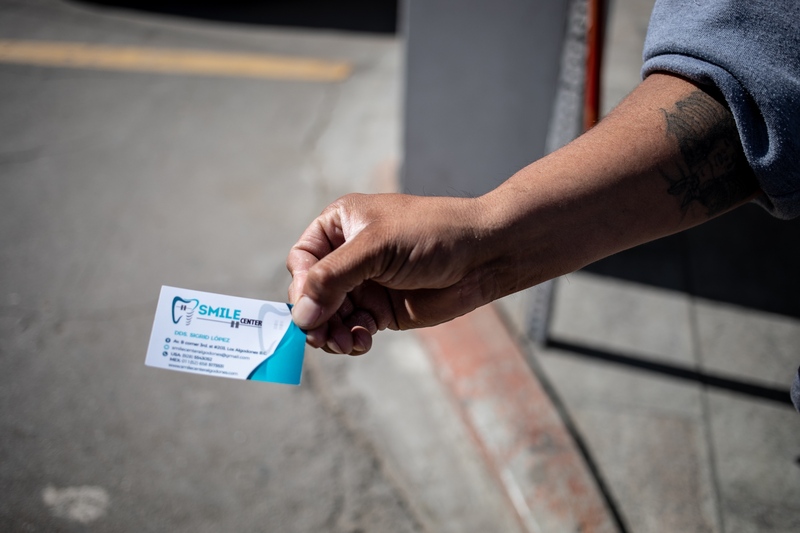 A picker offers a business card for a dental clinic in the historic downtown of Los Algodones. Usually pickers earn $100 a week, plus a percentage for every customer they bring in for dental work. Bruce Brodie, 67 years old. Brodie, who's now retired, has been working for as a firefighter for about 20 years. He lives in Yuma and crosses the border every other day to come eat tacos. He has a lot of friends in Los Algodones and has been to a few different dental clinics in town. 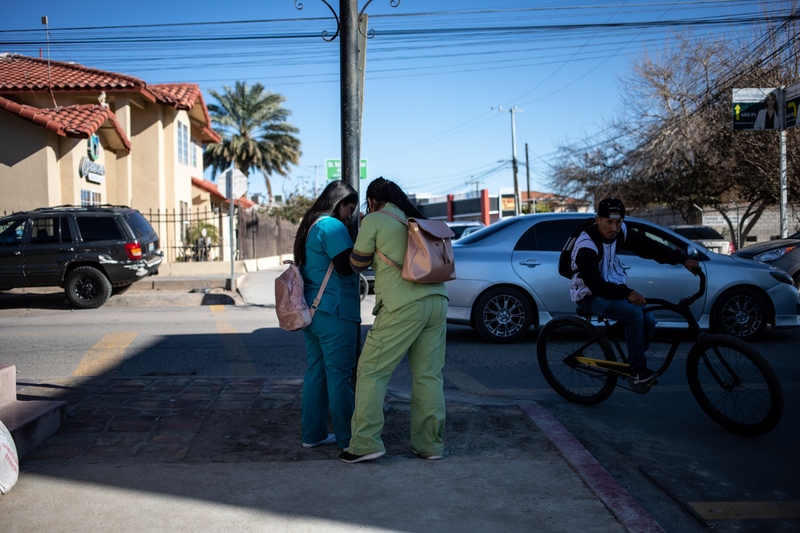 From the early morning the streets of downtown Algodones get busy with American (and few Canadian) tourists looking for dental clinics, opticians or pharmacies. But the town also entertains people with restaurants that offer Mexican food, margaritas and live music. The alleys are packed with stands selling local art and souvenirs. 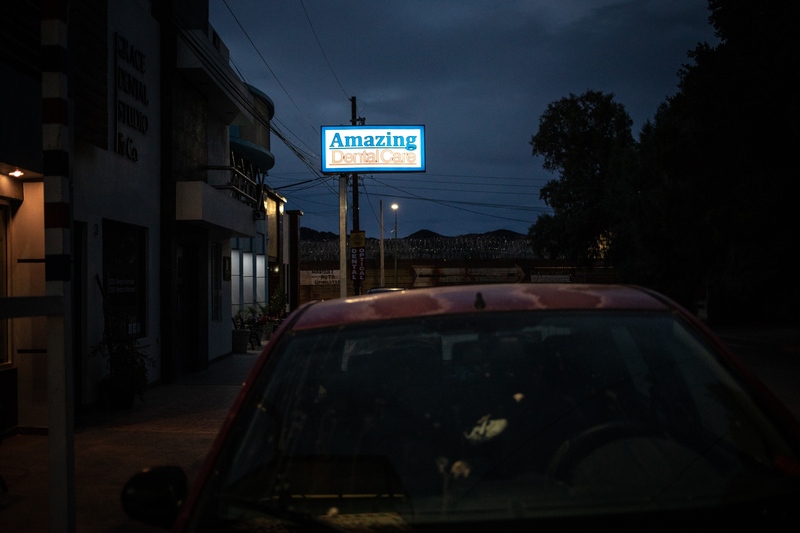 The border is open from 8 am to 10 pm, but usually after sunset the town is pretty much empty. English language magazines in the waiting room at Sani Dental, the biggest dental clinic in Los Algodones. Jessie, 32 years old. 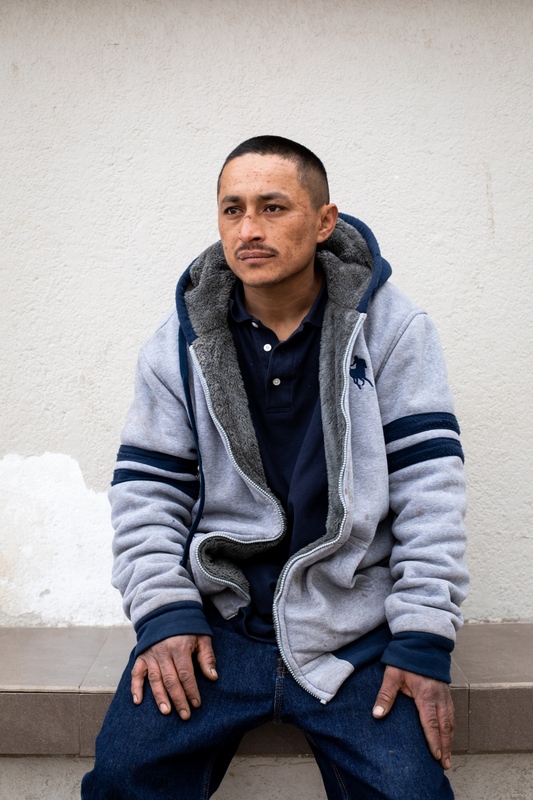 He works as a picker for a pharmacy in the historic downtown of Los Algodones. He spent his childhood in the U.S., where his mom still lives. He came back to Baja California with his dad when he was 14 years old. He got in trouble at 17 for smuggling marijuana across the border. Now he's not allowed to go back to the U.S.. He's been working as a picker for about two years and he earns $100 a week. 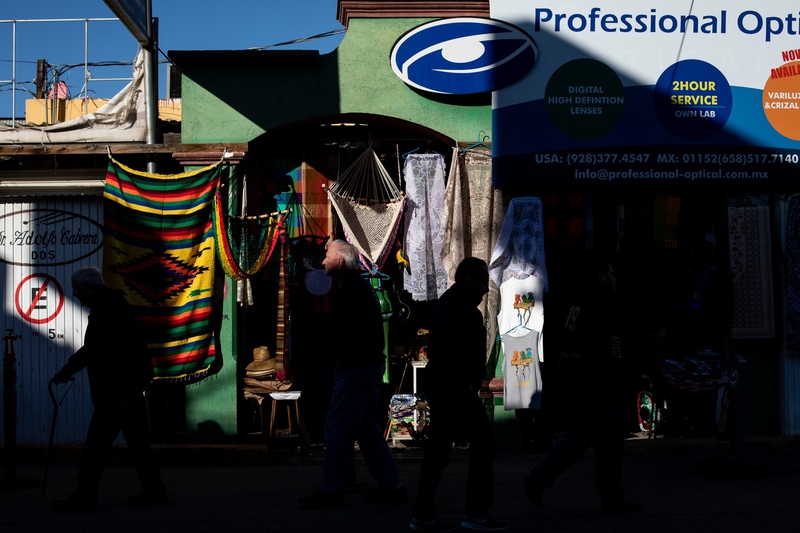 A dental clinic next to a souvenir market in the historic downtown of Los Algodones. Samantha Quinn (right) and her sister Sandra McGawwn (left) from Marina, California. Samantha, 54 works as a store manager at an ACE hardware store and doesn't have any medical insurance. "I live below the poverty line, I can't afford any insurance". 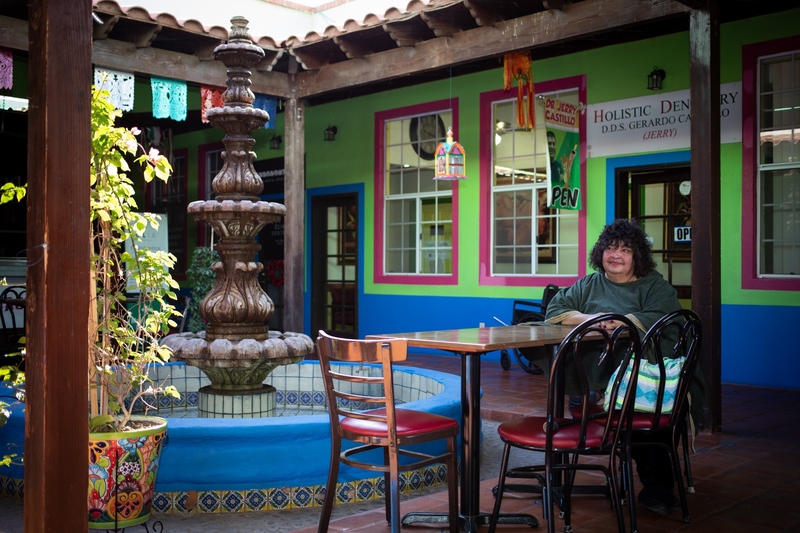 Her sister Sandra heard about Los Algodones from a few friends, so they decided to take the trip together. Samantha's spending five days in town and having a four days procedure which includes teeth replacements and multiple crowns. The all cost of the procedure is under $5000. Sandra, 64 is having a four days treatment for retainers and partials for less than two thousand dollars. The line to go back to the US can be pretty long in the afternoon. During high season, from October to March people can end up waiting for five or six hours. 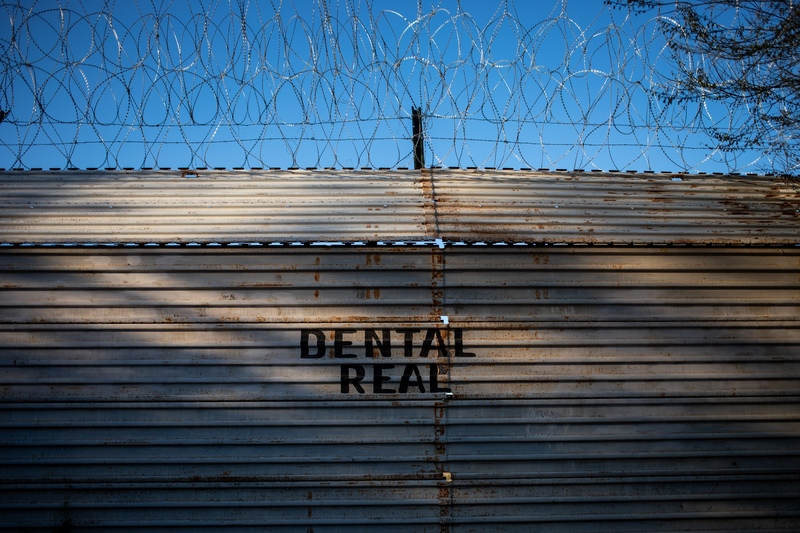 A Dental clinic ad on the Mexican side of the border. 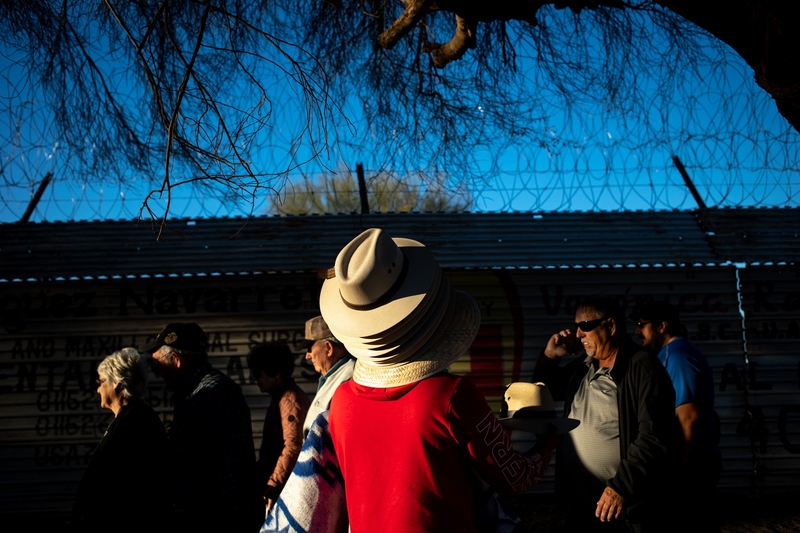 Once a mainly agricultural town, now Los Algodones is a popular destination for senior Americans who seek cheap health care. The town offers more dental clinics concentrated in one area than any other place in the world. Most of the people living in Los Algodones work in the medical tourism field. 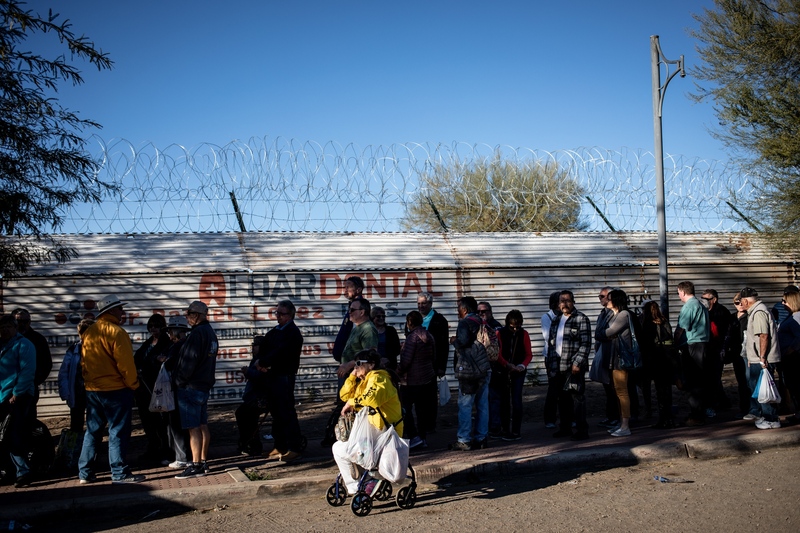 Tourists wait in line to cross the border back to Yuma (Arizona). During the high season, from October to March, people can end up waiting in line for even five or six hours. Tourists wait in line to cross the border back to Yuma (Arizona). During the high season, from October to March, people can end up waiting in line for five or six hours. When the sun comes down, the town empties out. Some tourists go back to their vans parked on the U.S. side of the border, others stay at the casino hotel or in other places in Yuma. 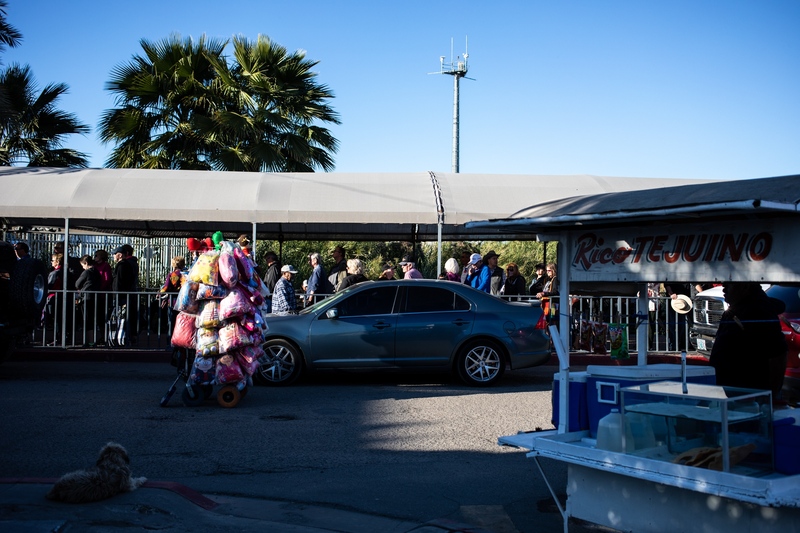 A lot of the tourists that come to Los Algodones are "snowbirds", senior residents of the U.S., who travel south during the winter to escape the rigid winters in the northern regions. A dentist performing surgery early at night at Hightech Dental clinic. Usually dental clinics are open from 7 am to 4 pm, but a lot of patients come into town without appointments hoping to find a good clinic in a short time and end up waiting in line for a few hours. 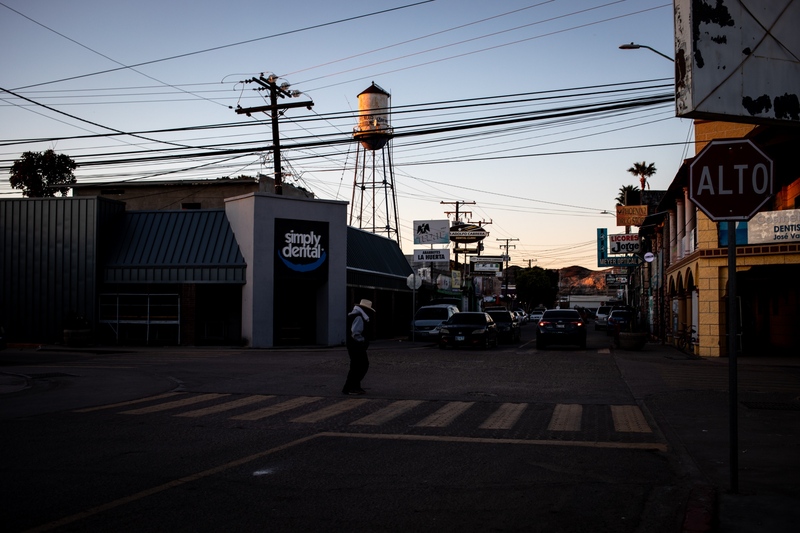 After sunset the streets of Los Algodones are pretty much empty. 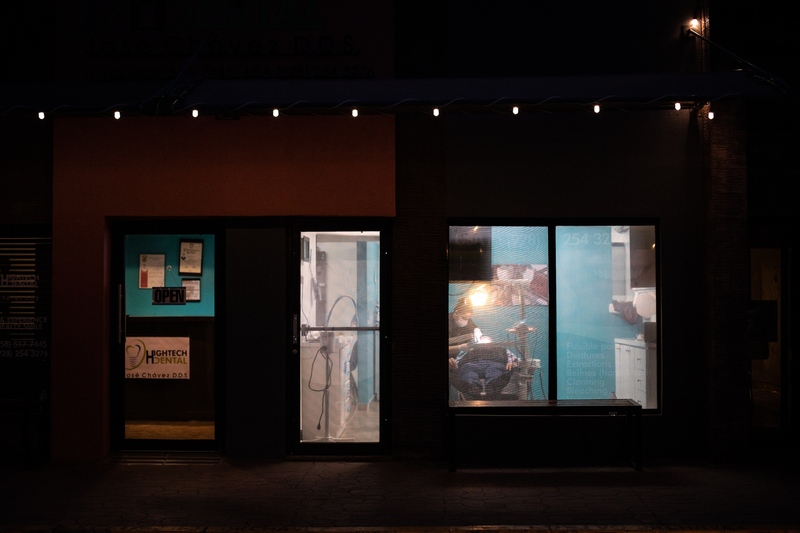 Here's a view of the borderl and a dental clinic sign in a back alley of the historic downtown. The US-Mexico border gets its fair share of attention. The wall. Drug smuggling. And migrant caravans fleeing violence in their home countries. 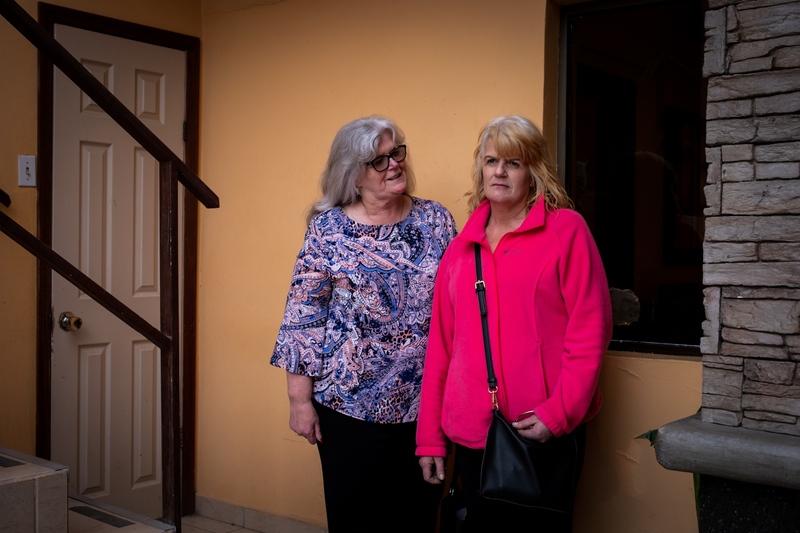 Lost in all that noise are the thousands of Americans crossing the border into Mexico, temporarily fleeing a menace in their own country – the high cost of medical treatment. 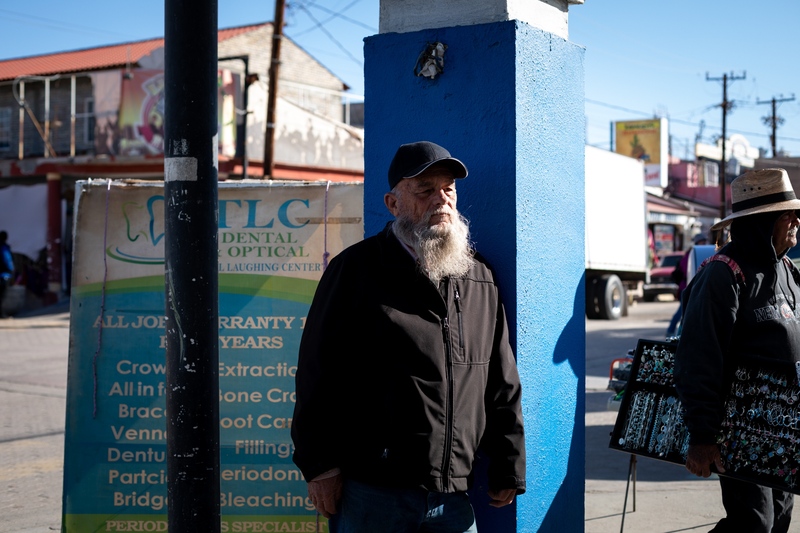 To access care they wouldn’t otherwise be able to afford Americans, for the most part senior citizens, are flocking to places like Nogales, Mexicali and Tijuana.In several Mexican border towns life revolves almost exclusively around the daily influx of Americans for health services. 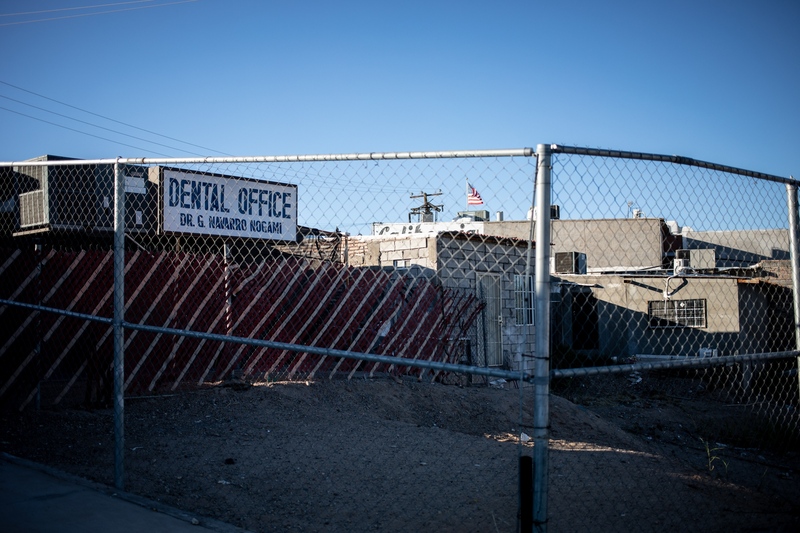 Los Algodones, seven miles west of Yuma, Arizona, has the most dental clinics per square mile in the entire world. That’s nearly 400 dental clinics in a town with a population of under 6,000. And it’s not hard to figure out why so many Americans are streaming across the border each day. 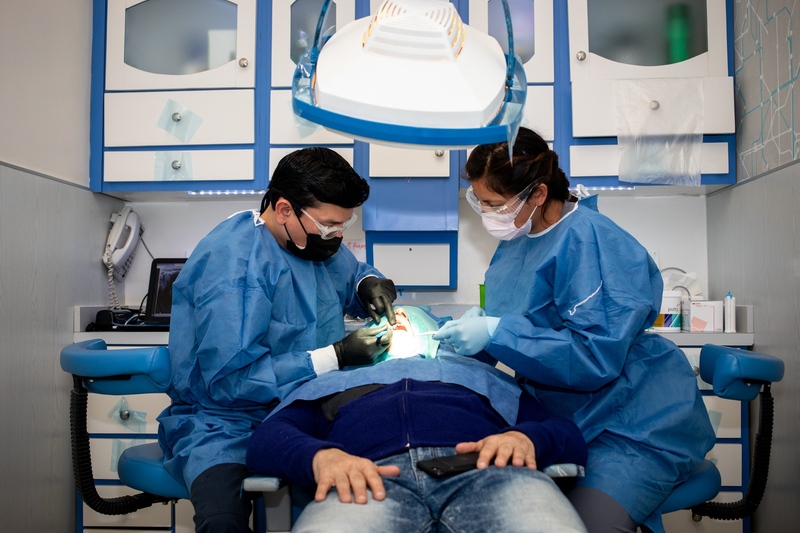 About 74 million Americans have no dental coverage (and much of that coverage doesn’t cover very much), and in Mexico they can save up to 70 percent compared to costs in the US. 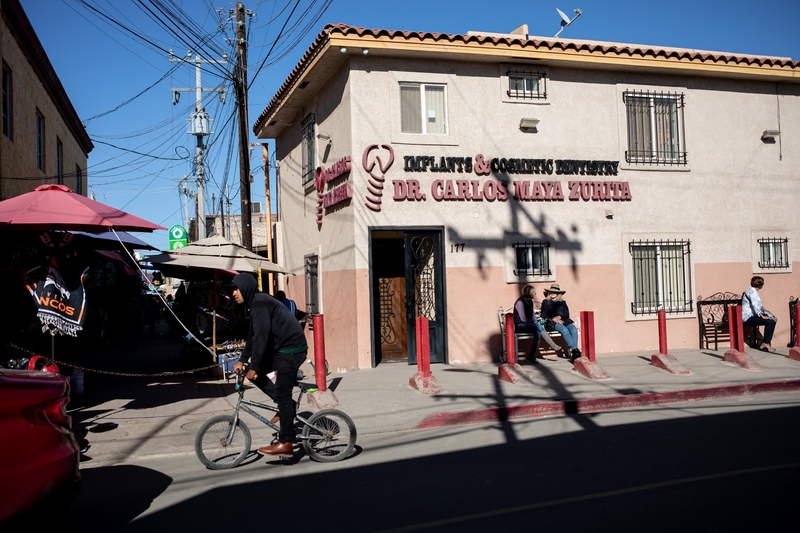 I spent 36 hours in Los Algodones photographing and interviewing people who crossed the border for dental care and I am planning to go back and visit other border towns in Baja California to keep documenting this issue. 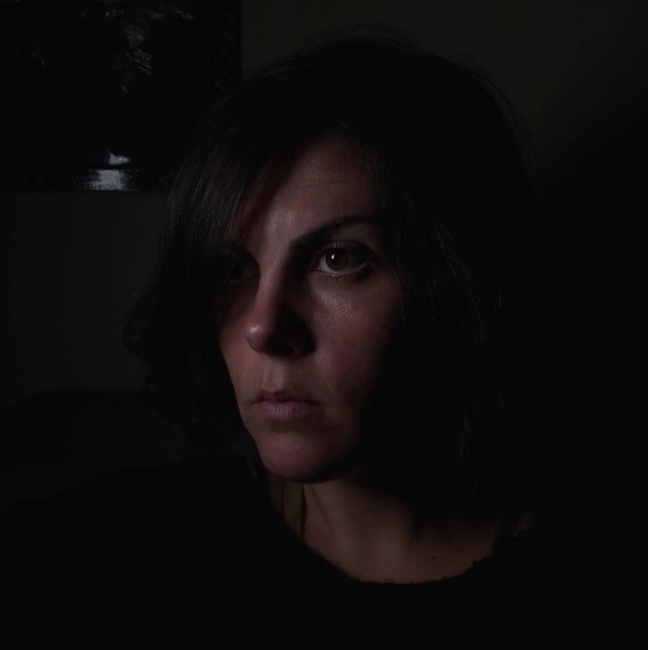 By Martina Albertazzi — I received a Catholic education, not because my parents were particularly religious, but because the church was seen as the center of the..